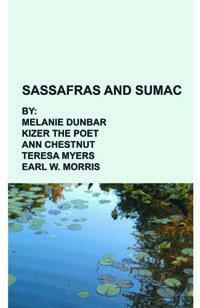 Sassafras and Sumac presents the poetry of members of Reflections of the Muse Poetry Society. We are a small group of poets trying to improve our work and to present it to the public. On November 5, 2011 members: Melanie Dunbar, Kizer the Poet, Teresa Myers, Ann Chestnut, and Earl W. Morris read from their work. We concluded we were proud enough to expose it to public scrutiny. It was well accepted by the small but appreciative audience.